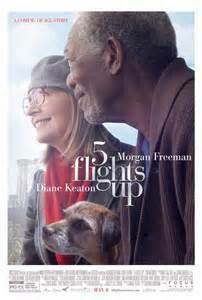 After 40 years of marriage, and living in the same Brooklyn walk up apartment, it is obvious that Alex (Morgan Freeman) and Ruth (Diane Keaton) are still in love and very comfortable with each other. They were married at a time interracial couples were still not accepted in 30 States and ‘got looks from people in the other 20’. As it is her parents didn’t accept them. Alex is a painter and Ruth was a teacher whose students became her children when she found out she couldn’t have children. In “5 Flights Up” we meet them at a time Alex is getting too old to walk up the 5 flight of steps to their apartment and their 10 year old dog is having spinal problems so they have put their apartment on the market and her niece Lily (Cynthia Nixon), who is a realtor, is handling the sale telling them that they should be able to get a million dollars and they can downsize to a smaller, less expensive place with an elevator. Though there is a secondary, needless, plot regarding a ‘terrorist’ this is a sweet movie with no special effects or wild car chases or explosives going off. Due to Freeman and Keaton charms and acting abilities you accept them as the long standing in love couple who know each others faults, quirks and endearments. He knows all the right answers to give her such as asking “What old Lady?” when she points to a recent portrait he had done of her and she remarks that she doesn’t know why he still is painting that old lady. She knows how to manipulate him even when he is aware what she is doing. Aside from their love story anyone who has ever sold an apartment or house will recognize the many different types who will show up such as those who just come to see how other people live or the woman who has to lay down on the bed to get the ‘feel’ of the place. Lily gives them nicknames such as ‘the dog ladies’ or ‘blue leggings’. It is an ongoing gag through the movie. Instead of the terrorist story the screenwriter, Charlie Peters, and the director, Richard Loncraine, could have spent more time on the background stories of Freeom and Keaton. In the few flashbacks Claire van der Bloom and Korey Jackson look enough like the present day Alex and Ruth to add believability to the unfolding of the love story if more had been on the screen. “5 Flights Up” is a sweet, believable, love story and shows changes that can, do, take place as people age. The photography by Jonathan Freeman shows Manhattan and Brooklyn as clean, sparkling boroughs and the music by David Newman adds, instead of distracts, to the film’s romance. While the film won’t win any awards it certainly should be seen to remember when Hollywood knew how to make love stories with happy ever after endings!